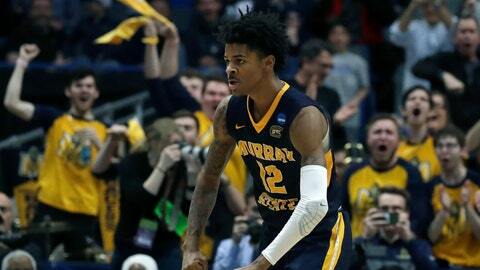 Morant led Murray State to the Ohio Valley Conference regular season and tournament championships and was the league’s Player of the Year. In the Racers’ first-round NCAA Tournament win over Marquette, he had the ninth triple-double in tournament history with 17 points, 16 assists and 11 rebounds. Morant, who averaged 24.5 points per game last season, is the first NCAA player to average 20 points and 10 assists since assists became an official statistic in the 1983-84 season.